My motivation was simple: take an absolutely stunning (stunning!) skein of hand-dyed, hand-spun yarn, and try to use it up, down to the very last yard. I followed the directions for the smallest size (3-6 months) when it came to stitch and row counts, but because the chosen yarns were thicker than those specified in the original pattern, I ended up with a sweater that’s between the two largest sizes. I think it should fit an 18-month old, or maybe even a 2-year old. Yarns: the green is Cedar Leaf hand-dyed, hand-spun, 80% BFL/20% silk that I purchased from PigeonRoof Studios. The skein had 140 yards, and I used up just about all of them. The burgundy is a commercially available yarn called Berroco Lustra in the Aubergine colorway (3160). It is 50% Peruvian wool, 50% Tencel Lyocell, 197 yards per skein. I used up about 170 yards. The stunning (stunning!) BFL/silk blend came first, and I paired it with the Lustra for several reasons. First and foremost, the two colors look great together! Both yarns have a noticeable sheen, so they really look like “they belong” in the same garment. 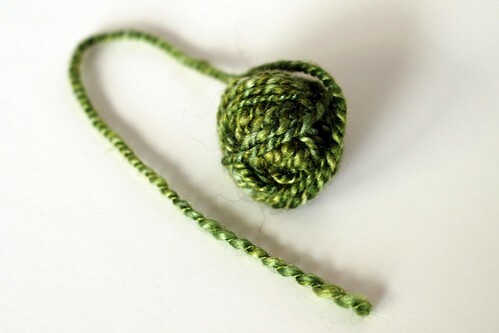 Second, the thickness of the two yarns is similar (but, in truth, not identical: the Lustra is noticeably thinner). Needles: As recommended in the pattern, I used US 6 needles for the main portion of the sweater, though I think I could have gone up a needle size without much impact on the fabric (but more comfort for my hands). 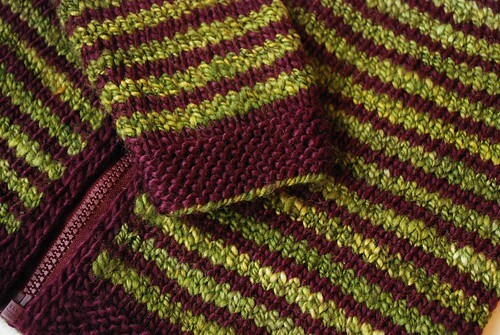 My gauge with these yarns was 4.5 stitches and 7.5 rows per inch of knitting. Other thoughts: for the first Budgie I was lucky to find the perfect zipper at Windsor Button: great match in terms of color, separating, not too chunky, with molded plastic teeth (so I could shorten it). For this sweater, the color choices available from Coats & Clark just weren’t going to cut it. So I turned to an old friend: ZipperStop! Their YKK #3 molded plastic separating sweater zippers are just perfect for this kind of project, and come in hundreds of colors. Delivery was ridiculously quick. I covered the back of the zipper with green grosgrain ribbon. We all know that I’m a process knitter through and through: I think 99% of what compels me to knit is the fact that I enjoy knitting. And this project is a prime example. Neither one of these yarns is particularly well-suited for a baby sweater. They are quite delicate, especially the single-ply Lustra, which would almost dissolve in my hands if I mistreated it. They are certainly not machine-washable. Along the same lines, the colors are rather mature and sophisticated, don’t you agree? So shouldn’t have I transformed these yarns into… a hat, or a cowl, or something for a grown-up? Probably. But I didn’t want to ;). I wanted to knit a striped baby sweater, practical or not, and so I did. Now I’m trying to think of a mom who would be willing to accept a handwash-only sweater (a saint is more like it) (Elinor?). But to tell you the truth, I will be just as happy to put this away into a drawer and never give it to anyone – the process of knitting this project made me exceptionally happy, and it wouldn’t matter to me if the sweater never got any use. How would you feel in this situation? Would you be disappointed knowing that your beautiful creation would never be used? I wouldn’t knit something that wouldn’t get used, but you have NOTHING to apologize for with this sweater. I would purchase a baby doll in this size and display the sweater on this doll maybe posed on a small rocking horse or in a small cradle. Wait! Wait! Send it to me because I have the doll and the rocking horse!! Not at all. I have a Baby Surprise Jacket that’s never seen the light of day. I too am a process knitter. Your striped sweater speaks to the deepest depths of my soul – I love stripes, the colors are divine and the execution is fantastic! I would give it to someone who treasures handknits and you know would wear it, otherwise…save it for the right baby! I think I would save it, show it to prospective parents of littles, and of anyone falls in love, I’d give it to them. Hand washing really isn’t that big of a deal, as I found out when I started washing my own wool diaper covers. It takes 5 minutes. That is a gorgeous sweater, and grown up colors are often stunning on kids. I also love how convenient it is that kid sweaters have equal length arms and bodies. Yay for simplicity! If there’s one thing I know about knitting it’s there aren’t any rules or supposed to’s! You wanted to knit that beautiful yarn into a beautiful sweater and you did! If it never sees the light of day again it’s not a waste, it’s your art, your process and your creation. I say do what feels right, hang that sucker in a shadow box, line the back of the box with this blog post printed on archival paper and let practicality be damned! Or have your own baby. Whatevs. That is so beautiful that I’d want to wear it or pet it as the case may be! Don’t give it away! It’s beautiful! You may find the right someone to give it to (or keep it for yourself if you think you may have kids). I’ve given my sister many handknits for her children over the years, and she hand washes every one. I’m a process knitting who doesn’t have much space and likes to make things to be used. It’s a dichotomy. Sometimes, though, I see a pattern and I just have to make it even though I’ll never wear it. The sweater is gorgeous. I hope that you find a home for it because it deserves to be shown off! Wow. That sweater is just stunning (stunning!). I mean it. I wish it were in my size and for sale. I would pay a fortune for it. So beautiful. I hand wash all of my baby’s sweaters, even the ones that can go in the wash. But I’m pretty sure I’m not a saint! I know exactly what you mean. I have knitted several items – some small (a cowl or two), some not so small (my first two sweaters!) – that made for absolutely amazing knitting experiences, and the fact that they do not get worn does not bother me a bit. I know that I will wear them some day, or that I will find the right person to wear them, but for now, looking back on the knitting process (and, okay, taking them out and fondling the fabric every now and again) keeps me happy. You’re too funny, knitting a self-indulgent gift! All my self-indulgent knitting is for me, me, me 🙂 Perhaps you could display it on the wall as art? It’s beautiful. Disappointed? No way. I photograph the heck out of that kind of project in an interesting location and call it a day. Personally, I tend to knit for my son in indulgent yarns. I’m not terribly concerned about handwashing the items – they’re small enough that it’s pretty easy to do (unlike a me-sized sweater that seems to take so much effort, and you’ve got to clear a spot to lay it out to dry, etc…) and I can actually AFFORD infant/toddler sweater-sized quantities. My son has a Malabrigo sweater. I will never have a Malabrigo sweater unless I win the lottery. I don’t think hand wash baby sweater isn’t that much work since it is small, so the washing is relatively easy. I love to knit lace shawls, but never really wear them anywhere. I let my 7 year-old daughter play dress up with them once in a while, and I admire them once in a while. Other than that they stay in a bag in my closet, and I’m perfectly fine with it. I totally get that! I’d have done the same thing! 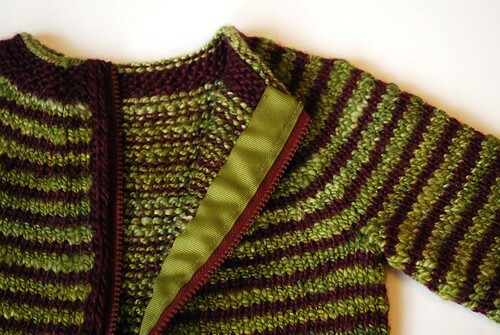 My good friend has a two-year-old who is regularly dressed in luxury handknits from my needles and her mother’s. Handwashing isn’t any more fuss than bathing the baby, and little L loves her soft handmade clothing. It’s gorgeous! I love the color combination and the zipper is perfect. If I were you I’d give it to Cheryl for Eloise. It is beautiful. Probably only a knitter should be a recipient for full appreciation. But I know what you mean, sometimes I’m the one who appreciates the project the most. What a great idea, ribbon over the zipper. Just lovely. Simply beautiful. I like the shadowbox idea. Who says anyone has to wear it! It’s beautiful and anyone you gifted it to would be very lucky. I think you should keep it until you have the perfect person to give it to. Beautiful! I love the colours. Most of my daughter’s sweaters are hand wash only, so I may not be the best to judge, but I would want it to be worn and loved. Find a knitter friend to give it to who understands that hand washing isn’t really all that much work? god those colors are gorgeous. I still need to try some of the pigeonroof handspun yarn, but that’s so hard to get! I’ve knit sweaters I just keep in a drawer. I love working with yarn and watching the stitches form. A sweater I get to wear is just bonus most of the time. Gorgeous!!! I’ve knit many things that never get worn. I don’t think it would bother me at all to tuck it safely in a drawer to be taken out and admired from time to time. That said, if ever there was a mom who had the combination of sophisticated aesthetic and willingness to hand wash a perfect little baby sweater that mom is Elinor. The sweater is gorgeous…I love the colour choices, perfect. I have knit baby items for non knitters and the choice it baby cashmerino. I know if it hits the dryer it will survive. I figure if they get to wear it once, it is well worth it. I myself am very careful about laundering. I like doing laundry, knitter or not, I am careful of how things are washed. If I knew the recipient is careful with laundry they would most likely recieve a handwashable knit. Of course, any knitter would appreciate a hand wash knit! All my baby’s sweaters are hand wash — its no big deal. Wool doesn’t need to be washed much anyway and they stop spitting up after the first few months. 18-24 months? Easy. That would get multiple wears and then a quick swish in the sink with some soak or eucalan and lay it on the counter on a towel for a few hours. No problem. Especially for something so beautiful and special. I think the gift should almost certainly be accompanied by a small bottle of wool wash, and a note with care instructions, but it will be well loved. All the hand-wringing about hand-washing is silly, imo. First of all, babies do not soil their clothes all the time, for heavens sake. So it’s not like their outerwear needs to be washed after each wearing. And when it needs washing, it’s just a matter of soaking it in the sink for a half hour and then laying it somewhere to dry. What’s the big deal? It’s not like we have to haul water from the creek and heat it over an open fire or bang things with stones to get them clean! I love your sweater! Keep it or gift it as you will, but don’t let hand-wash become an obstacle to baby things! It’s a beautiful sweater. 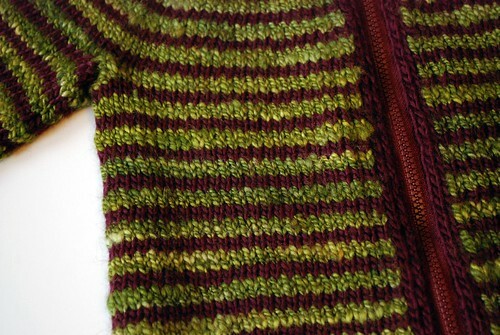 I love the more mature colors for a baby sweater. Keep it or gift it, it’s still a beautiful knit worth having been made and that is what matters. Well I have a friend who’s having a baby. A friend who’d be willing to have a special sweater that the baby (toddler) only wears for special occasions… And who happens to be doing the baby’s room in green and purple. But I know such people are rare. And to give away such a gorgeous sweater you’d need to find a very close and trusted friend. I don’t finish as many items as I start, because I enjoy the process of knitting more than any other part (except maybe yarn fondling). I feel a bit bad if something doesn’t get used, especially if it turns out that the project wasn’t fun (aka, some of the gift knits I’ve done), but it is really about making fabric from string. I envy process knitters. I think about knitting somethng “just for the heck of it” all the time –except I have no time because of my huge long list of projects that I want to knit specifically for something or someone. I’m locked into the product knitter mode for now but who knows, maybe when I retire I shall just knit for the sheer fun of it without a care as to the usability of the product or not — yeah, doubt that will ever happen. BUT, your sweater is stunning and I think you should sell it to a fancy boutique! It’s beautiful. Can you frame it and keep it to look good on your wall? I’d be tempted, if it were my knit creation. Sometimes you just have to knit a work of art, even if it languishes in a dresser drawer. A pregnant knitter friend was going to be the recipient of some handwash-only items (I figured she was worthy and would know how to care for it), but before I finished the items, I learned she had requested machine-washable items only from friends, so it is now squirreled away, to be saved for either my future children or another child whose mother is comfortable with washing it by hand. Being a process knitter myself who plain knits for the fun of it, I say keep it! But don’t take my word for it, I’m the goof who would stick it in a recess frame and decorate my office with it…. Even though I am more of a product knitter, I wouldn’t mind if I knitted something that didn’t get used – as long as I was happy with how it turned out. One knit in particular is the baby norgi sweater. I knitted it a few years without anyone in mind, and it still doesn’t have an owner, but I am completely satisfied with the project. Whenever I come across it I admire the colorwork and neat finished steek facings. I so regret not letting my kids wear things (that they were given) because they were “special” or “precious” — they grow so fast too soon. I guess I don’t think handwash only is such a big deal for baby stuff. I wouldn’t give it to someone who isn’t used to caring for wool, but I’ve knit some non-superwash wool stuff for my soon-to-be-baby, and I can’t bring myself to machine wash even the 100% acrylic sweater I have for her that my grandmother made when I was a baby. Maybe I’ll change my mind when I’m actually faced with washing these things, but I doubt it. Would I be disappointed, well, it depends on why I made the item. I am disappointed when day to day items (dishcloths and wristwarmers spring to mind) do not get used. But something made, because I want to make it, especially without an intended receipient, there is joy in the making, and that is where the joy is for that item. Wow…just gorgeous! Love the colors! It’s tricky to say. On one hand, a lot of the purpose of knitting things in this era of reasonably-priced, semi-reasonable quality OTR clothing is to knit for the fun of it. So to that end, that adorable little sweater has served its purpose. A sort of Velveteen Rabbit scenario, if that makes sense. Sure, the rabbit would have been in better shape if he had been left to sit on the dresser all the time, but would he have been as well-loved? Grumpy, aren’t you and Mr. Sweetness going to have a baby someday? You love your mom and dad and grandmother so much. I like to think of you keeping that chain of love alive. I have a whole basket of items that I made just for the joy of making them….not intending to ever give them away or use them….I just love to knit and to figure out new patterns and to use lovely yarn. Maybe put your lovely sweater on an infant sized teddy bear, display it, and just admire it! i too am a process knitter. i’ve knit a bunch of socks merely for the joy of knitting them. and even though i almost never wear them, i’m happy to see them piled up on my handknit sock shelf. i usually try to use washable yarn for gifts because most non-knitters don’t know how to wash wool. 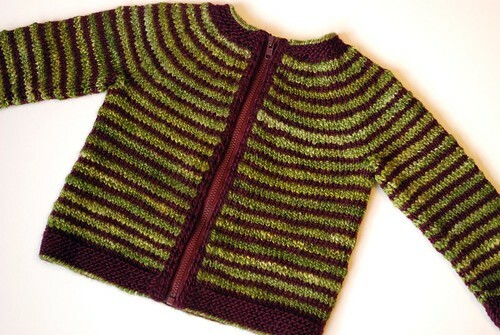 but i’m sure you’ll be able to find someone who will treasure and delicately care for this lovely cardigan. I think it’s a gorgeous sweater, and it wasn’t at all a waste of time! I’m a process knitter, too, but one of the things I love about knitting is that the things I make are also usable. You just need to find a mom who is also a knitter and often has handwash-only things to wash! I’m not a mom yet, but I know I’ll be making handwash items for my own baby – in fact, I already have! Man! At this point I’m seriously wishing I could fit into it! What a fabulous sweater! I would NOT put it away where I couldn’t see it and (ahem) I think I might also have trouble giving this one away. Have to say – you have created an absolutely beautiful garment. Beautiful. The colours complement each other so well. I think I would be inclined to put it somewhere safe, for fear of ruining it with actual use or improper care. My daughter is too big for this sweater, so I’m not hinting – if it were ours, I’d keep her wearing it without washing it ever until she outgrew it, just wipe it a bit with a damp cloth. Just give it to a baby who doesn’t puke much – mama can take it off during mealtimes, and use it for tidy activities like stroller rides with dry snacks and water. But I don’t think it’s wasted if you don’t give it away. It’s something you’ve given to yourself, and that’s ok.
Are you kidding? I’m salivating. Can I buy it from you? Would you sell it? My daughter is nearly 2 and half, but I’d have another girl just to dress her in that awesomeness. Seriously, get back to me if you’re interested. Wow. I don’t have children and knit a February Baby Sweater just because I felt like it. I keep saying, “someone will have a girl soon,” to save face, but I actually have no intention of giving it away! I vote to put it away, and someday, perhaps you will know just who it was made for. It is STUNNING! It’s superb! I love stripes! I think if I knit a utilitarian item, and it was never used, I *would* be disappointed. That’s why not many people get hand-knit gifts from me. I knit lots of wool socks for my mom and for me. We both appreciate them and use them. Beautiful…any mom or baby will be thrilled to receive this as a gift! I’m happy it’s a larger size…I rarely knit anything below a size 1…or even a size 2 sometimes because the babies grow so quickly they are lucky if they get to wear something three times! And my handknits are always hand wash only and no one complains! I love your color sense. Practicality be damned! No problem not using it (at the moment – you can always change your mind). Love the colours but they are difficult to get things to go with, if you are out shopping keep an eye out for something to be the other half of the outfit. I think it is gorgeous, and I would have put all our children in it (I also like that it has dark cuffs, because that is an area that can always get dirty). I have just proven to myself that I am not a process knitter. Because reading the post, I clicked through to the Zipper Stop link and am overwhelmed with the OMG I HAVE to knit something with those Swarovski Crystal zippers NOW! But, I do have things on hand that I knit because I wanted to knit them and now am wondering what to do with them. I agree with Diana, get a doll to wear the sweater. Then you can have it on display, cause that’s a gorgeous sweater. I love that sweater. I am the kind of mother who never liked all that fru-fru pink and blue stuff. I put it on my kids if someone gave it to me, but when I shopped for my babies I bought pretty jewel tone colors that “I” liked. I would only give that sweater to a fellow knitter, i.e. someone who would take the time and effort to care for it properly. Otherwise, I would hang it up on the wall and look at it! It’s gorgeous. I’ve knit things that I doubt I’ll use. But I enjoyed the knitting and I enjoy seeing the finished object. 🙂 So I wouldn’t be disappointed by non-use. That is such a nice sweater and lovely colors. Perhaps a long lost friend will show up with a mature and sophisticated baby. I am pretty much the same way as you. I knit things that I know I’ll barely use, if at all (for me this is mostly shawls and certain styles of hats that I don’t feel I can pull off). I love them though. I love looking at them and seeing them hanging or neatly stacked in my closet. I’ve got a couple baby things that I couldn’t bear to give away too and I’ve saved in hopes that I’ll someday have another kid. So yeah, I don’t get disappointed about it. It’s the process of making all these things that I love! Another beautiful Budgie. Those colors would look lovely on a child with dark hair and pale skin. I say put it in a Hope Chest and keep your fingers crossed! Never say never! It is a beautiful sweater, you accomplished a lot and you enjoyed the knitting. Sounds pretty good to me. I’ve knit a couple things that sit in a drawer, either waiting for a ‘worthy’ recipient or just there for me to learn from and enjoy. I consider myself a product knitter, but even so, I have things I’ve made just to try the technique or pattern. Maybe someday they’ll find a home, but not until it’s one that will appreciate them. Meanwhile, they reside next to my stash. Wonderful colour combination and superb finishing. I would give it to a child with a mother who is fine with hand washing and doesn’t feel that a garment needs to be washed every time it’s worn. Someone who is prepared to brush/pick off the odd bit of mud/cereal/unidentified gunk as appropriate. Kids and their clothes are much healthier that way! Every detail, perfect. Right down to the ribbon facing to finish the zipper band. This is one of my favorite color combinations. I would put that on my daughter in a heartbeat. It is two of her favorite colors. I wouldn’t let her eat in it, or go to the playground in it, but she could get plenty of wear out of it. It is really beautiful – what do you plan to do with it? Hang it on the wall? I didn’t read any of the comments above so forgive me if someone has already commented as such. If you feel that connected to that sweater, I’d put it away and wait for the special baby who deserves it. You’ll know it when it happens. It doesn’t matter if it’s 10 years from now. That sweater is timeless. Love the color choice and that zipper is so perfect! I have found that most new Moms and Dads really love a hand knit sweater and are more than willing to treat it like the heirloom that it is. And I love the colors!!! I don’t particularly care for colors that are too precious and pale for children. Their skin is delicate that I think they look beautiful in more mature colors. I almost forgot–you can include a bottle of Soak or Euclan with your gift. Most folks who hate hand washing really just hate the rinsing. Problem solved. Thanks for letting me know zipperstop.com exists. I’ve needed zippers for some projects and they have just what I need at good prices too!